Massive changes to Govia Thameslink Railway’s rail timetable will see almost 400 new trains running every day from next week. The rail operator, which runs Southern, Thameslink, Gatwick Express and Great Northern services, says its proposals are a step forward in its programme to boost capacity across the network. Passengers are being urged to check before they travel ahead the shake-up, with the time of every train changing from Sunday May 20. Charles Horton, GTR’s chief executive, said: “We are introducing the biggest ever change to a rail timetables to significantly boost capacity on the UK’s most congested network. We don’t want passengers to get caught out and so we strongly advise them to look up the times of their trains as they will find that from 20 May each and every one of them has changed. “Due to the sheer scale of the changes, we will have to redeploy a large number of trains and crews and services may not run at normal times during the introductory phase, although the impact on peak time services during the transition will be minimal. The new timetable will see around 3,600 trains running across the network, a 13 per cent increase. Many passengers can expect their trains to start and terminate at different stations, for example many King’s Cross services will instead call at the adjacent St Pancras International. The changes will increase space into London for an extra 50,000 passengers in the morning peak. Due to the expansion, 80 more stations will have direct services to central London stations such as Farringdon, City Thameslink and Blackfriars by next year. According to GTR rail passengers will benefit from enhanced frequency, reliability and connectivity across the network, with significant uplift at key commuter stations such as Brighton, Bedford, Luton and East Croydon. Some disruption to services is expected during a major re-deployment of trains and crews over the coming weeks. As part of the decade-long upgrade project, London Bridge has undergone a £1bn rebuild and, in Britain’s biggest fleet order, some 115 new self-drive Siemens trains are being introduced. However the RMT union, which has been fighting the further extension of driver-only operation on Southern services, suggested the new GTR timetable ‘will place massive additional strains on infrastructure and staffing levels that are already struggling to cope with current capacity’. • Improved morning peak mainline services from Eastbourne to London Victoria with three additional peak arrivals at 0705, 0735 and 0754 filling an existing two-hour gap. • The first train to London Victoria from Eastbourne will depart 20 minutes earlier providing an earlier arrival into Gatwick Airport. • Doubling the length of most trains along the most popular sections of the east coast route, between Brighton and Hastings (especially busy in the summer). Increasing the frequency of services by a third between Eastbourne and Hastings. 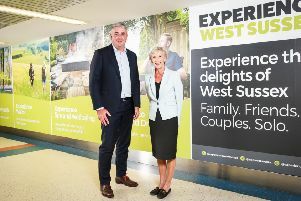 Trains will also connect better with the high-speed services at Ashford International, saving passengers time, for example a 99-minute journey time from Bexhill to St Pancras changing at Ashford International. • Thameslink trains to London Bridge (two in May 2018 rising to three in December 2018) extended to London Blackfriars, City Thameslink, Farringdon, St Pancras International and beyond to St Albans, Luton and Bedford. • From May 2018, 12 more carriages and 669 more seats to London in the morning peak via Worthing and Hove. From December 2018, 12 more carriages added with a further 638 seats. From December 2018, this will provide a combined total of 24 additional carriages and an additional 1,307 seats. • Daytime frequency continuing until 2200 with additional trains between Brighton and West Worthing & Littlehampton and Portsmouth & Southsea and others amended. • Direct hourly services until 2100 (currently 1700) from Portsmouth to Horsham, Gatwick Airport and London Victoria. • Additional direct evening service from London Victoria to Chichester departing at 2206 filling an existing 60 minute gap. • Improved service for Portslade with introduction of half hourly direct weekday off peak and Saturday trains to and from London. • New direct all-day Sunday trains for Portslade and Lancing with the introduction for hourly trains to and from London Victoria for the first time. • Sunday services between London and Portsmouth will now serve Horsham matching weekday and Saturday routing. • Improved connections at Hove from Brighton for trains to and from Littlehampton on Sundays. • An additional evening peak train will be introduced from London Bridge to Uckfield on weekdays and earlier Sunday morning trains will be introduced on the Uckfield route. Are you affected by the changes? Email the newsdesk.